Indigenous peoples have sought recognition of their identities, way of life and their right to traditional lands, territories and natural resources for years, yet throughout history, their rights have always been violated. Indigenous peoples today, are arguably among the most disadvantaged and vulnerable groups of people in the world. The international community now recognizes that special measures are required to protect their rights and maintain their distinct cultures and way of life. Find below a short history of the indigenous struggle in the international stage. In 1923, Haudenosaunee Chief Deskaheh travelled to Geneva to speak to the League of Nations and defend the right of his people to live under their own laws, on their own land and under their own faith. Even though he was not allowed to speak and returned home in 1925, his vision nourished the generations that followed. 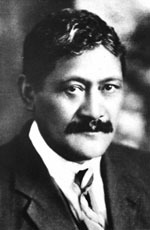 A similar journey was made by Maori religious leader T.W. Ratana. To protest the breaking of the Treaty of Waitangi concluded with the Maori in New Zealand in 1840 that gave Maori ownership of their lands, Ratana first traveled to London with a large delegation first to petition King George, but he was denied access. He then sent part of his delegation to Geneva to the League of Nations and arrived there later himself, in 1925, but was also denied access. In the history of indigenous issues at the United Nations, there is considerable thinking and debate on the definition of “indigenous peoples”, but no such definition has ever been adopted by any UN-system body. One of the most cited descriptions of the concept of the indigenous peoples was given by Jose R. Martinez Cobo, the Special Rapporteur of the Sub-Commission on Prevention of Discrimination and Protection of Minorities, in his famous Study on the Problem of Discrimination against Indigenous Populations. In 1982 the Working Group on Indigenous Populations (WGIP) was established as a subsidiary organ to the Sub-Commission on the Promotion and Protection of Human Rights. The Working Group provided an opportunity for indigenous peoples to share their experiences and raise their concerns at the UN. As a subsidiary organ of the Sub-Commission, the Working Group was located at the lowest level of the hierarchy of UN human rights bodies. Its recommendations had to be considered and accepted first by its superior body, the Sub-Commission, then by the Commission on Human Rights and the Economic and Social Council (ECOSOC) before reaching the General Assembly. Following reform, the Human Rights Council adopted resolution 6/16 to request the Office of the High Commissioner for Human Rights to convene an informal meeting to discuss the most appropriate mechanisms to continue the work of the Working Group on Indigenous Populations. The Informal meeting took place in Geneva on 6 and 7 December 2007. As a follow-up to the informal meeting the indigenous caucus and a number of governments continued informal negotiations to finalize a draft resolution to submit to Human Rights Council. On December 14, 2007 draft resolution A/HRC/6/L.42 (HRC Resolution 6/36) was adopted establishing the Expert Mechanism on the Rights of Indigenous Peoples (EMRIP). As a result, the Working Group on Indigenous Populations met for the last time in July 2007. The ILO has been engaged with indigenous and tribal peoples’ issues since the 1920s. It is responsible for the Indigenous and Tribal Peoples Convention, 1989 (No. 169) , the only international treaty open for ratification that deals exclusively with the rights of these peoples. The ILO’s Decent Work Agenda , with gender equality and non-discrimination as a cross-cutting concern, serves as a framework for indigenous and tribal peoples’ empowerment. Access to decent work enables indigenous women and men to harness their potential as change agents in poverty reduction, sustainable development and climate change action. 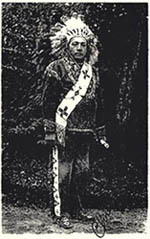 In 1993, trough resolution A/RES/47/75 the UN General Assembly proclaimed the International Year of the World’s Indigenous People with the aim to encourage a new relationship between States and indigenous peoples, and between the international community and indigenous peoples — a new partnership based on mutual respect and understanding. The year was requested by indigenous organizations and is the result of their efforts to secure their cultural integrity and rights into the twenty-first century. To assist with the Year’s programmes and activities, and to foster educational and cultural events, the UN Secretary-General opened the Voluntary Fund to which Governments were invited to contribute. In 1994, the United Nations General Assembly adopted resolutions A/RES/48/163 and launched the International Decade of the World’s Indigenous Peoples (1995-2004) to increase the United Nations’ commitment to promoting and protecting the rights of indigenous peoples worldwide. As part of the Decade, several UN specialized agencies worked with indigenous peoples to design and implement projects on health, education, housing, employment, development and the environment to promote the protection of indigenous peoples and their traditional customs, values and practices. The UN Permanent Forum on Indigenous Issues was established in July 2000 as an advisory body to the Economic and Social Council, with a mandate to discuss indigenous issues related to economic and social development, culture, the environment, education, health and human rights. The Forum is made up of 16 members acting in an individual capacity as independent experts on indigenous issues. Eight of the members are nominated by governments and eight by the President of ECOSOC, on the basis of broad consultation with indigenous groups. The Permanent Forum holds two-week sessions once a year, usually in May, in which indigenous peoples organizations, States, UN bodies and organs, inter-governmental organizations and NGOs – that have consultative status with the ECOSOC -participate as observers. The first meeting of the Permanent Forum was held in New York in May 2002. In recent decades, the international community has given special attention to the human rights situations of indigenous peoples. In this context, the Commission on Human Rights decided to appoint in 2001 a Special Rapporteur on the rights of indigenous peoples, as part of the system of thematic Special Procedures. The Special Rapporteur’s mandate was renewed by the Commission on Human Rights in 2004, and by the Human Rights Council in 2007. Conducts or contributes to thematic studies on topics of special importance regarding the promotion and protection of the rights of indigenous peoples. The Second International Decade of the World’s Indigenous People (2005-2015) was proclaimed by General Assembly resolution 59/174 and the Programme of Action was adopted by General Assembly resolution 60/142 and is contained in document A/60/270. The goal of the Decade is the further strengthening of international cooperation for the solution of problems faced by indigenous people in such areas as culture, education, health, human rights, the environment and social and economic development, by means of action oriented programmes and specific projects, increased technical assistance and relevant standard setting activities. The second decade concluded in December 2015. Promoting full and effective participation of indigenous peoples in decisions which directly or indirectly affect their life styles, traditional lands and territories, their cultural integrity as indigenous peoples with collective rights or any other aspect of their lives, considering the principle of free, prior and informed consent. Re-defining development policies that depart from a vision of equity and that are culturally appropriate, including respect for cultural and linguistic diversity of indigenous peoples. Developing strong monitoring mechanisms and enhancing accountability at the international, regional and particularly the national level, regarding the implementation of legal, policy and operational frameworks for the protection of indigenous peoples and the improvement of their lives. The Fund was mainly used for providing small grants to projects that indigenous organizations or organizations working for indigenous peoples applied for funding with a budget for up to US$ 10,000 covering one year’s expenses. From 2006 to 2014, the Trust Fund awarded grants to a total of 151 projects with a predominance of projects in Asia, Africa and Central and East Europe and Caucasus. Due to limited resources, the Trust Fund had, however, only been able to grant funds to 151 out of a total of 4110 project proposals submitted . The projects funded have mostly covered the area of human rights (38%) and social and economic development (23%), with 32% focusing specifically on women and 31% on youth – a continually increasing trend. Also, of the funded projects, 57% provided an important opportunity for indigenous peoples to engage directly in dialogue with States. The projects have mainly been implemented with a local focus (76%), with a majority in the rural areas (66%). The final report on the achievement of the goal and objectives of the Second International Decade of the World’s Indigenous People follows a midterm assessment in 2010 and an assessment in 2012. It provides examples of current efforts to achieve the objectives of the Programme of Action for the Second International Decade of the World’s Indigenous People. One of the major highlights of the Second Decade was the adoption, in 2007, of the United Nations Declaration on the Rights of Indigenous Peoples. The report also provides an analysis of the impact of the Second Decade on the achievement of the Millennium Development Goals. While there has been some progress in achieving the goals of the Second Decade, a substantial gap remains between the formal recognition of indigenous peoples and the implementation of policies on the ground. 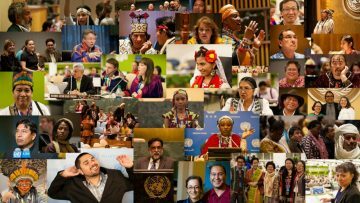 The post-2015 development agenda and the high-level plenary meeting of the General Assembly, to be known as the World Conference on Indigenous Peoples, afford an opportunity to make indigenous peoples part of the solution and to build a life of dignity, equity and hope for all. Indigenous peoples have also participated in major world conferences, such as the UN Conference on Environment and Development (Earth Summit), held in Rio de Janeiro in 1992, the World Conference on Women, held in Beijing in 1995, and the 1996 Social Summit. Indigenous peoples also were prominent in the 2001 World Conference against Racism, which was held in Durban, South Africa. The Expert Mechanism on the Rights of Indigenous Peoples (EMRIP) was established by the UN Human Rights Council, in 2007 under Resolution 6/36 as a subsidiary body of the Council. The Expert Mechanism provides the Human Rights Council with thematic advice, in the form of studies and research, on the rights of indigenous peoples as directed by the Council. The Expert Mechanism may also suggest proposals to the Council for its consideration and approval. The Expert Mechanism is made up of five independent experts on the rights of indigenous peoples which are appointed by the Human Rights Council. The Expert Mechanism holds an annual session, usually in July, in which representatives from States, indigenous peoples, indigenous peoples’ organisations, civil society, inter-governmental organisations and academia take part. The Special Rapporteur on the rights of indigenous peoples and a member of the Permanent Forum on Indigenous Issues are invited to attend the annual session of the Expert Mechanism to enhance coordination and cooperation between these indigenous mechanisms. Funding for representatives of indigenous communities and organisations to attend the Expert Mechanism can be sought from the Voluntary Fund for Indigenous Populations. The Declaration on the Rights of Indigenous Peoples was adopted by the General Assembly on Thursday September 13, 2007. The Declaration is the most comprehensive statement of the rights of indigenous peoples ever developed, giving prominence to collective rights to a degree unprecedented in international human rights law. The adoption of this instrument is the clearest indication yet that the international community is committing itself to the protection of the individual and collective rights of indigenous peoples. The Declaration is a culmination of over twenty years of work, that began in earnest at the Working Group which began the drafting of the declaration in 1985. The first draft was completed in 1993, and in 1995, the Commission on Human Rights set up its own working group to review the draft adopted by the human rights experts of the Working Group and the Sub-Commission. More than 100 indigenous organizations participated in the Working Group of the Commission annually. In addition to participating in large numbers in the Working Group on Indigenous Populations and other meetings, indigenous people are also becoming more prominent as individual players on the world stage. The first World Conference on Indigenous Peoples was held on 22-23 September 2014. The meeting was an opportunity to share perspectives and best practices on the realization of the rights of indigenous peoples, including pursuing the objectives of the United Nations Declaration on the Rights of Indigenous Peoples.